The Taller Guaguarey was conceived by Alicia Rodriguez after friends and community members expressed concerns about the funding cuts and possible closure of the free adult pottery workshop sponsored by the Municipality of Cayey, Puerto Rico. In 2018, after discussions with the Mayor of Cayey, Alicia Rodriguez made a commitment to look for alternative funding for these classes. With this commitment, the Taller Guaguarey project was started. 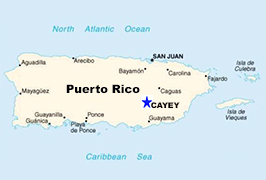 Cayey is a mountain municipality in central Puerto Rico. It has a population of 16,003 people with a median age of 41.8 and a poverty rate of 54.2%. In Puerto Rico overall, 44% of the population lives in poverty. Families and communities are suffering from a mass exodus of Puerto Ricans from the island because of lack of jobs, privatization of public assets, closing of schools (especially those in the arts), increases in water, electrical and gas rates, etc. A root cause of the injustices and inequalities in Puerto Rico is the imposition of a colonial reality that is based upon the destruction of self-esteem, self-determination, well-being and awareness of the vital connections to self, others and the earth. This colonial reality threatens the Puerto Rican cultural identity, economic independence, people’s health and communities. The pottery workshops provide a place where people can build connections to self, community, cultural traditions, and generate income through the art of pottery making. The Taller Guaguarey is working in partnership with the Municipality of Cayey to ensure that the pottery classes are a continuing resource available to the Cayey community. The Municipality has reaffirmed its commitment to provide access to the existing classroom, equipment, water, electricity, and a registration processes for students. Taller Guaguarey’s goal is to maintain and expand the free classes by raising funds to cover the cost of supplies, tools, additional equipment, and a teacher’s stipend. Help us by making a donation today. Maintain free pottery classes, with an open registration policy, accessible to the all members of the community. Provide comprehensive access to tools, glazes, and other resources that insure broad skill development for every student based on their goals for the class. Motivate participants to create clay pieces of the highest quality that will enable students to generate income. Inspire a spiritual awaking of the artistic talents that reside within each student. 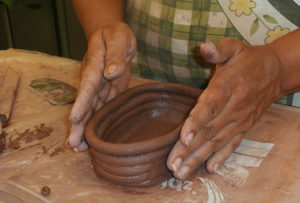 Build each participant’s connections to the self, community, and Puerto Rican cultural traditions through the art of pottery making. Encourage deeper friendships, freedom to develop patience and awareness that failures present opportunities to learn new things. Provide inspiration to the larger Puerto Rican community, and draw students, tourists and other visitors to the community so that they may experience the practical and spiritual values of pottery making. The Taller Guaguarey is a new organization and we need your support to get the project started and to build a sustainable program over coming years. 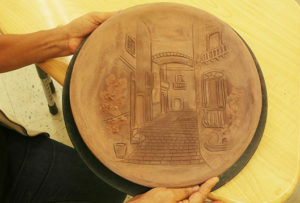 Your generous donation will help us deliver pottery workshop classes throughout the year, enhance the student experience by providing tools, glazes, and other art resources in the classroom, and begin the long-term dream of building the Taller Guaguarey as a regional clay arts center in Cayey, Puerto Rico. The Taller Guaguarey is a fiscally sponsored project of the Peace Development Fund. Through our fiscal sponsor, the Peace Development Fund (PDF), a 501(c)(3) public foundation, our supporters are able to make tax-deductible donations. The PDF will provide each donor with the appropriate tax receipt. Thank you for your support. All donations made through this PayPal button are automatically directed to Taller Guaguarey. Please indicate “Taller Guaguarey” in the memo line to ensure it gets to us!